Love is in the details. That's how Jim Porterfield conveys his love to his children, never wavering even as he's faced hardship. KATY, Texas — Love is in the details. That's how Jim Porterfield conveys his love to his children, never wavering even as he's faced hardship. In 1981, Jim was struck by a drunk driver and airlifted to the hospital. He had more than a dozen surgeries before fading into a coma for six weeks. Doctors didn’t expect him to wake up. The Texas native not only survived, he also became a father of four. It wasn’t without challenges though. Jim has lived with ongoing seizures and the aftermath of crushed bones that require a cane to walk. The accident also affected Jim’s cognitive abilities. Diagnosed with short term memory loss, Jim can name almost any 70s tune and list the band members and album, but when it comes to recalling what he had for lunch that day, he struggles. Yet, to his children – this is what makes dad their dad. They never knew their father before the accident. “People say, ‘Do you wish your dad was normal?’ My dad is normal. He’s my dad. He’s the best dad I can ask for, and I’m proud to call him my dad,” said Jim’s youngest daughter, Morgan. 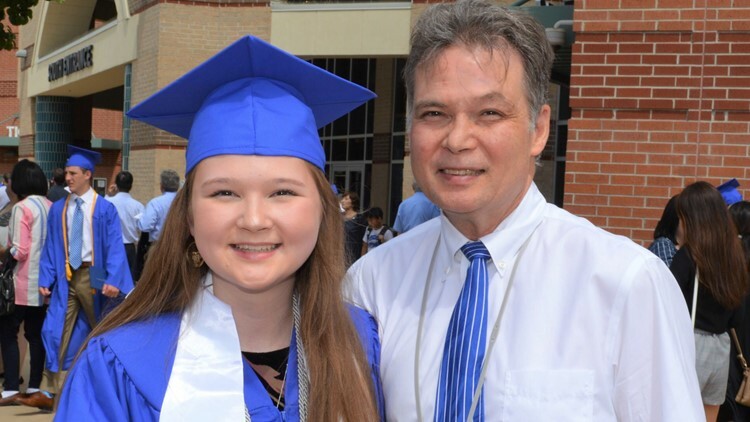 Morgan, a music loving 18-year-old, describes her father as her number one fan. Growing up playing the piano, she was always joined by her father who would sit, listen and enjoy at the dining table beside her. Whenever she had choir recitals, her dad brought along coworkers and a bouquet of flowers. Jim has always shown his love for his children, even during trying times. In June 2018, Jim lost his job as a filing clerk for The Gas Company after he was replaced by digital advances. Money was tight as he struggled to find employment as a disabled man. Morgan got a part-time job at McDonald’s to save up for a car before college. Before work every day, she went to Starbucks to get her daily treat of an iced coffee. This didn’t go unnoticed to her father. Touched by the sweet gesture, Morgan posted a picture of the gift on Twitter before she went to sleep. At that point, she had around 40 followers who were mostly her friends. The next morning, she woke up to 60,000 likes. “I was so confused. I was like, ‘Why is it getting that much attention?’” recalled Morgan. But as she scrolled through the comments, she realized people were thirsty for inspiring stories. Many comments urged Morgan to start a GoFundMe fundraising page for her father so they could donate. Without telling her father, her three sisters and brother decided to launch the GoFundMe. Within days, it raised thousands of dollars. “I’m so thankful… my dad has always been my hero. I was so grateful everyone else could see him in the same light too,” said Morgan. Morgan and her siblings waited until Father’s Day to tell Jim about the thousands of dollars raised for him. The money has provided Jim and his family with the gift of security. Due to Jim’s conditions, he is constantly at risk of falling. Along with saving the money for medical and emergency purposes, they purchased a recliner for him to get in and out of easier. Morgan hopes her father’s small act of kindness can be a reminder for others.